The post credits scene of Avengers: Infinity War didn't mean much to most movie goers, but comic book fans who recognized the symbol and Nick Fury's beeper were jumping out of their seats. 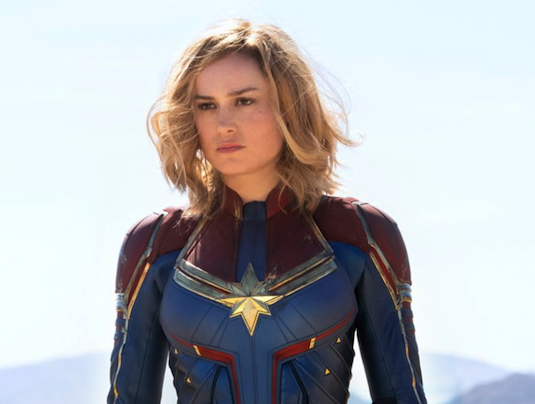 We still don't have a clue how Captain Marvel will tie into Avengers 4, but we can only hope her upcoming solo movie gives us some answers. What we do know about Marvel's first female led superhero movie is that it will take place in the 90s, and feature some familiar (And digitally younger) faces including Fury and Phil Coulson. We also know that the classic Marvel villainous shapeshifting aliens the Skrulls will finally be making their big screen debut, meaning just about anyone in this movie could secretly be one of them. 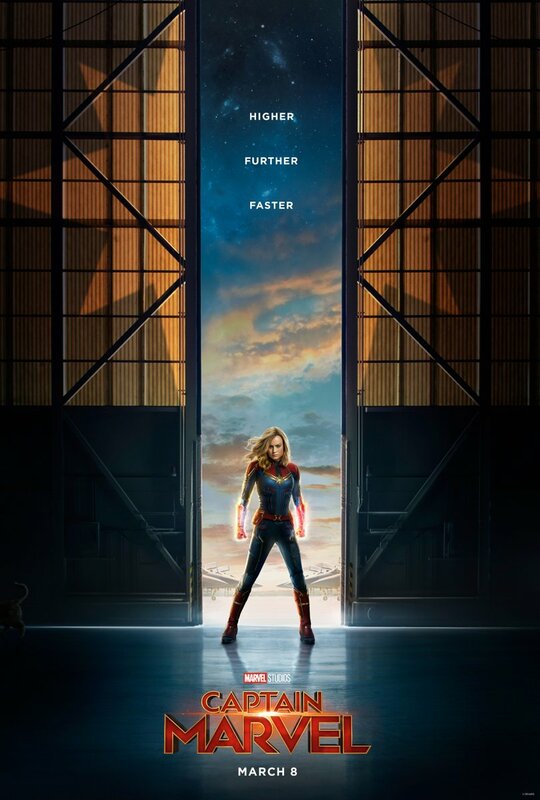 So of course to the relief of many fans who saw the first set photos of Brie Larson in costume as Captain Marvel, its clear that the green suit will only be worn for a portion of the movie. 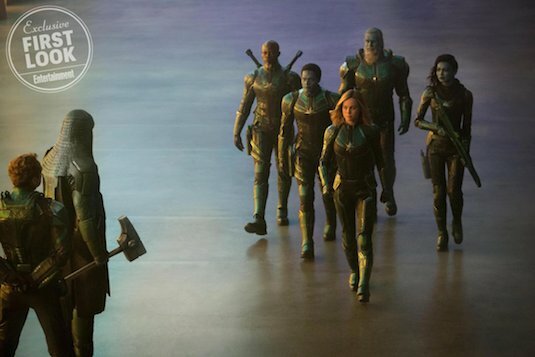 We can see that Danvers is part of a team of sorts led by Jude Law's mystery character (Who we all believe to be Mar Vell, the original Captain Marvel). You also may recognize Korath from Guardians of the Galaxy, and of course Ronan who was the villain of that movie. Its unknown how he will play into the story here, but in the comics his race (The Kree) have been at war with the Skrulls, so its possible he may actually be of some assistance in taking them down. 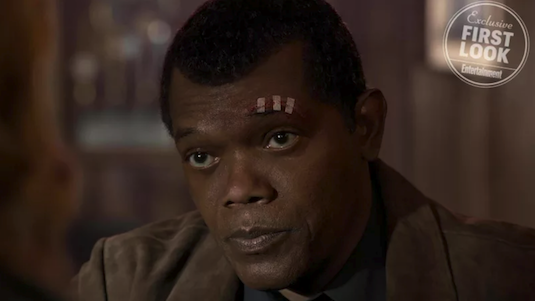 As for the other big standouts of the trailer, a nearly flawlessly de-aged Samuel L. Jackson shows us a much less experienced and high ranking version of Nick Fury. Its likely that in this movie we will be learning how Fury loses his eye, as we can see a shot of him in a hospital holding ice to it. Clark Gregg's young Agent Coulson unfortunately isn't as convincing, with the CGI looking a bit obvious specifically on his hair. Hopefully the finished product will look just as clean as the work done on Jackson, as his character will probably be getting a lot of screen time. Pretty much everything else about this trailer is strictly speculation, but hopefully the old lady Carol punches is actually a Skrull (And not really just some old lady on a train). We hardly see the Skrulls in this trailer, so they'll likely be taking on human forms for most of the movie. There's been speculation the glowing eyes of Law's character good indicate he is one of them. We also learn that Carol Danvers doesn't actually remember if she's from Earth, and only can see bit and pieces of her childhood. This will make for an interesting subplot of her own self discovery of where she came from, similar to the arc Peter Quill went through in Guardians. So what did you think of the Captain Marvel trailer? Who do you think will secretly be a Skrull in the movie? Let us know below!